The wonderful Jess Keating is at The Hiding Spot discussing her debut entitled How to Outrun a Crocodile When Your Shoes Are Untied, her writing process, and her inspiration behind main character Ana! 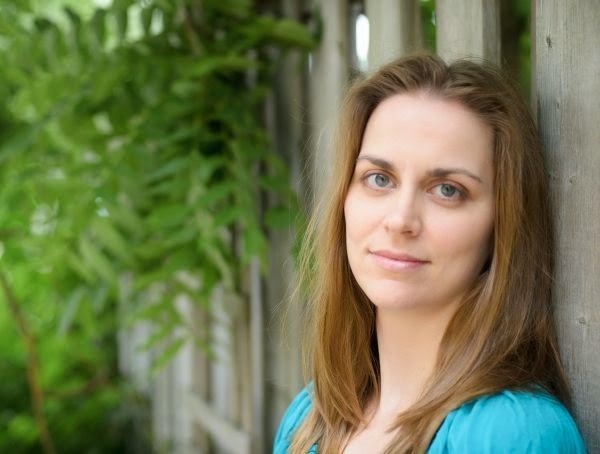 As a zoologist turned middle grade and picture book author, Jess Keating has been sprayed by skunks, bitten by crocodiles, and been a victim to the dreaded paper cut. Her debut How To Outrun A Crocodile When Your Shoes Are Untied is out now from Sourcebooks Jabberwocky, with a sequel to follow. Her nonfiction picture book, Pink is for Blobfish, will be published by Knopf in 2016. Did you have trouble writing any of your characters or specific scenes within the novel? Alternately, were any characters or scenes particularly easy to write? Like all books, this one was a labor of love and there were definitely growing pains. I had to work very hard to keep my 'adult' brain out of it, especially in scenes where Ana and Ashley are interacting. For example (without spoiling things), I can say that in book two, we learn a lot more about Ashley. But to 12 year old Ana, she's just a Sneerer. It was so important for me to let Ana's view (however clouded it might be by her hurt feelings!) run the show, because I wanted to let the story unfold without me oversteering. On the other hand, any scene with Daz came quite easily for me. I'm not sure what that says about me! It's possible I'm a criminal mastermind? Ana, your main character, is a whiz with animals, but she’s also painfully shy and insecure. Did you have a specific inspiration for Ana’s character and the situations she encounters in the novel? I do think that, shy or not, we all feel like Ana does at some point or another. The struggle to fit in while still being yourself is something that feels universal to me, so getting to write about Ana's journey somehow made me even braver. Tell me a little bit about your writing process: Do you outline? Start at the beginning? The middle? The end? Most of my books start with the character and the setting. I love voicey characters and unusual, quirky places. This part involves mainly research, and I bury myself in facts until I get a feel for how a character would relate to it. This is also the point where I start to conjure up the character's overall arc, and where I want them to end up after I've put them through the ringer. As far as writing in sequence, I tend to go all over the map, particularly when I'm just starting to draft. If a scene hits me that I know will have a place, I usually trust myself and write it, hoping that it will make sense in the end when I puzzle-piece it all together. This does mean I have some scenes that get cut, but I don't see it as wasted writing, because I've learned that much more about the character! Has the title changed or stayed relatively the same as your novel journeyed towards publication? The title is pretty much the only thing that hasn't changed about my book! The moment it popped into my head, I knew I was on to something. The rest of the story came later, through a lot of work! What jobs did you have on your way to becoming a published author? Is there a certain work experience that has shaped your writing or provided inspiration? I had several jobs, most of which revolved around science and animals. One of my favorites was at a wildlife rehabilitation center, where I spent all day chasing animals and doing outreach and education. I also wrote nonfiction articles for magazines and led zoology workshops at university, where I got to yammer on about animal bones and kooky behaviors. The biggest thing I have in common with Ana is a love of the natural world, and a really deep desire to express that to anyone who will listen. She looks better in the safari hat, though. If you had to pick a favorite word, what would it be and why? Ooh, tough question! Zephyr is one of my favorites. It means 'soft breeze', and I love it because my best days are spent outside. I also love the word 'nefelibata', which is super weird, but means 'cloud walker', or, someone who lives in the clouds of their own imagination. Beautiful, right? My blog is dedicated to my personal hiding spot, books. Who, what, or where can be credited as your personal escape from reality? I have so many! Like every writer I know, I love escaping into books, especially funny ones, or anything that takes me to a magical place. I keep a copy of INKHEART next to my bed just in case I need a fast escape. And, as nerdy as it sounds, I actually love escaping into research. The world is JUST SO COOL. I can spend hours poring over books, watching documentaries, and often get lost in so many blogs I need to remind myself to get back to work. I get a big thrill every time I can add something I've learned into one of my books. For example, I just discovered there is a fish whose scientific name is Boops boops. Tell me that isn't hilarious! More books! The second book in the My Life is a Zoo series, called How to Outswim a Shark Without a Snorkel is coming out in January, 2015. I'm really excited for people to read this one, because we get to learn more about Ashley. She's a total pill in CROC, but as always, there are two sides to every story. I've also got my first nonfiction picture book coming out in 2016, from Knopf! It's called Pink is for Blobfish, and it's all about subverting the gender expectations of the color pink, using cool animals to tell the tale. As you can tell from the upcoming titles, animals are still going to play a major role in my writing! Great interview, interesting questions and replies!